A recurring column about the hottest things to do outside of the Chicago Loop! Chicago is a city full of wonders. You can easily traverse the its unique character distinctions by riding the entire Red Line “L” route, north to south, from Howard to 95th Street. While you’ll clearly notice its economic disparities along that ride, you’ll also experience the vast diversity of the third largest city in the United States. But let’s diverge from that seminal route and head slightly southwest off the Pink Line “L” to a beautiful cultural mecca known as Pilsen, Chicago’s largely LatinX community. While it may very well succumb to the inevitable effects of gentrification in the next decade, Pilsen remains a timepiece in the city’s rich cultural history. Your first stop should be the National Museum of Mexican Art. 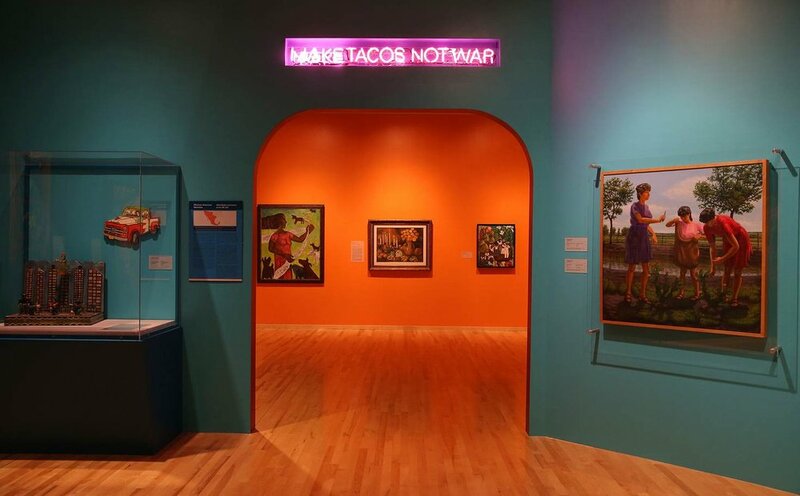 The first and largest museum and cultural center dedicated to Mexican, Chicano, and Latino culture in the United States, the NMMA is the only member of the American Alliance of Museums dedicated to Latino culture. Boasting over 6,000 pieces of art in its permanent collection, art shows, and educational program, the NMMA is the recipient of the Time Out “Love Chicago” 2016 Award. 1852 W 19th St; Tuesday-Sunday, free admission; Pink Line: Damen or 18th St. The colorful interior of The National Museum of Mexican Art in Pilsen. Photo courtesy of Getty/ Chicago Tribune. For a no-frills delicious bite to eat, La Casa Del Pueblo Taqueria (also includes an adjacent grocery store) is as close to unpretentious as they come. Their signature tender tamales are the draw, as well as the homemade pico de gallo--green not from cilantro, but from jalapeño. Eat up for under $10! 1834 S Blue Island Ave; Pink Line: 18th St. The vintage selection at Knee Deep Vintage in Pilsen. Photo courtesy of Knee Deep. For some thrift shopping, avoid the north side of the city and check out Knee Deep Vintage, founded by locals Trent Marinelli and Carlos Lourenco in 2008. Specializing in fashion-forward vintage clothing and accessories, as well as hard-to-find pieces from the '20s-'50s, Knee Deep brings in new finds daily (and accept trade-ins for store credit or cash), so shop often! 1425 W 18th St; Open daily; Pink Line: 18th St. The bar at Simone's in Pilsen made out of recycled pinball machines. Photo courtesy of Simone's. When you’re ready to relax and engage in that favorite MBA student pastime (drinking), head to Simone’s. Entirely made of repurposed materials, Simone’s dons a rooftop herb garden and numerous solar panels, and is one of a few environmentally-friendly spots in the neighborhood. Catch tons of live music, art, extensive food and drink menus, and several event spaces. 960 W 19th St; Open daily; Pink Line to 18th St. So, grab a friend or two, hop on the Pink Line “L” train (or catch an Uber if you must), and head to one of Chicago’s hidden, yet bustling, gems. Fill up on tamales and vintage clothing, art, and all the live music and drinks you can stomach. Then spread the word about this cultural mecca. John challenges Boothies to get out and explore more of what Chicago has to offer!